The same as before: Tier II and Tier I pesticides, defined as more hazardous and most hazardous. 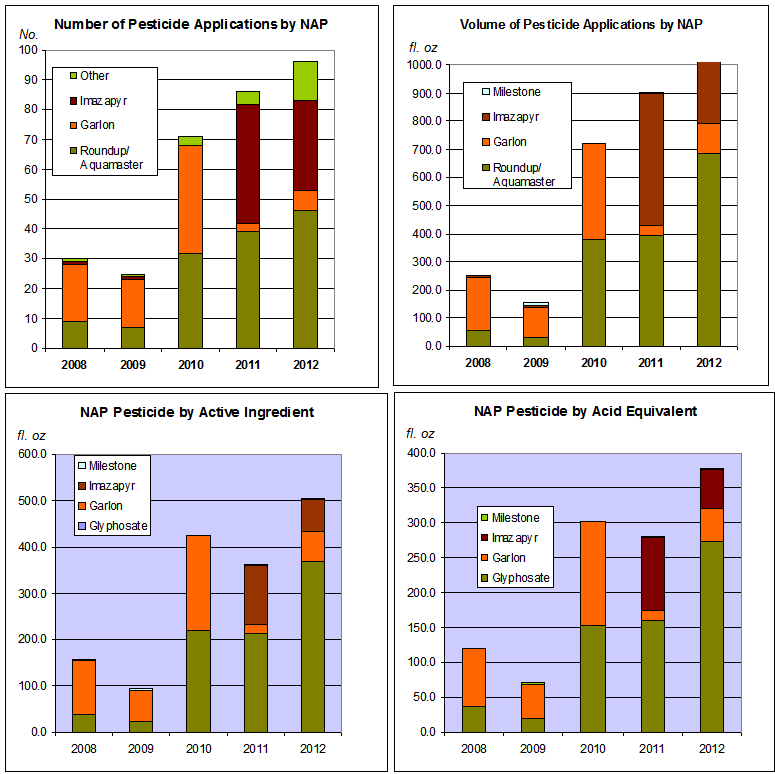 (For a detailed discussion of these chemicals, click HERE: Natural Areas Program’s Pesticides: Toxic and Toxic-er. Aquamaster/ Roundup (Glyphosate). (Tier II) This is one of the world’s most widely used herbicides, but in vitro research has linked these chemicals to changes to human cells, some of which are of the kind that could cause birth-defects. The EPA is studying whether it is an endocrine disruptor. The fact that it’s widely used gives us little comfort; a different widely used herbicide has just been declared unacceptably toxic to bees. Recent research indicates that both triclopyr and imazapyr are potentially toxic to butterflies – but NAP continues to use both Garlon and Polaris on Twin Peaks, where NAP are also struggling to re-introduce the endangered Mission Blue butterfly. Glyphosate is known to be dangerous to amphibians; but NAP uses Aquamaster around Lake Merced, Pine Lake, and in Glen Canyon – all near water-courses. Who [name names] is responsible for these obvious assaults on our parks? It is important to know–and to stop this nonsense. There is a virus going around–one that is in the minds of those who would poison and kill trees and shrubs all over the parks of our city. What will stop them? Raise your voices, stop the vices. I don’t understand what’s going on. Why is NAP spraying toxic chemicals and downing trees? The goal of habitat “restoration” does not involve mass exterminations with toxic waste–what’s at the root of this, and who would knowingly do this? Any sane natural areas protector would never dream of doing something like this, so I really don’t understand. The logic is that non-native species have “invaded” the ecosystem (though the trees were actually planted for the most part). This has created a whole new ecosystem. If it’s to be “restored” to the way it was in 1769, then the trees and other non-native vegetation must go. That requires pesticides, repeatedly, because the reason the non-native plants are established here is that they are better suited to the current conditions – which no longer suit many of the “native” plants. We oppose destroying existing ecosystems and habitat; we have no quarrel with native plants. What results from these efforts is an impoverished habitat with less cover for birds and animals, a continuing use of pesticides, and access restrictions on park users to keep them off the native plant gardens NAP is trying to create.